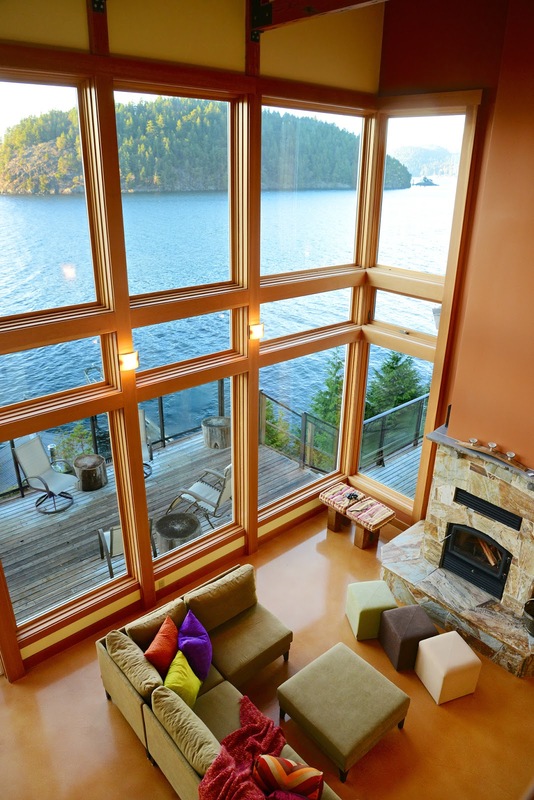 The Eastman Waterfront Retreat is a show-stopping Bowen Island vacation rental property with panoramic views of gulf island wonder. And as with all gulf islands, natural beauty comes with a variety of weather in all seasons, from spectacular sunshine to moody watercolour-like washes of blues and greys. 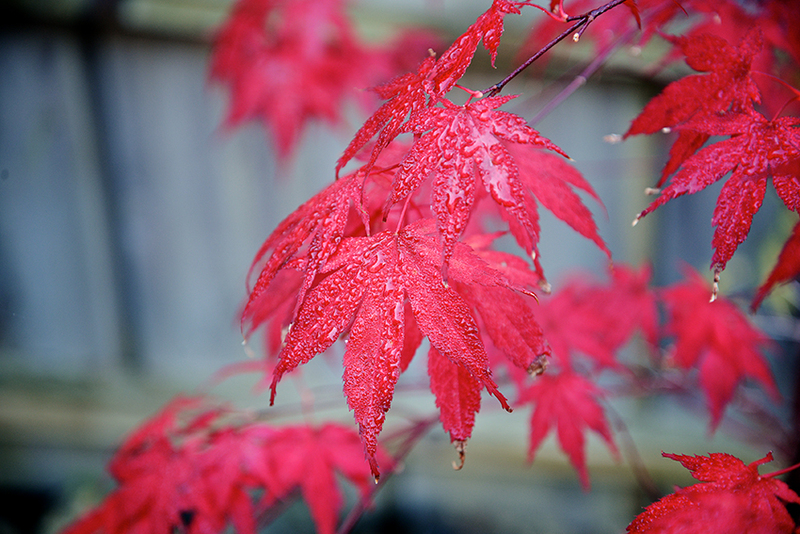 What our off-season guests know (and probably keep secret), is that even the occasional rainy days have a special beauty all on their own, and the Eastman Waterfront retreat is poised to feature this beauty perfectly. Here are a few reasons why the fall, winter, and spring are great times to book your restful vacation at the Retreat. For some, winter vacations have a whole other purpose than summer vacations. In summer, the weather is lovely and guests want to leave the house to explore the trails and water. In contrast, winter getaways are about self-care, introspection, and getting cozy, and the Eastman Retreat fosters these qualities admirably. 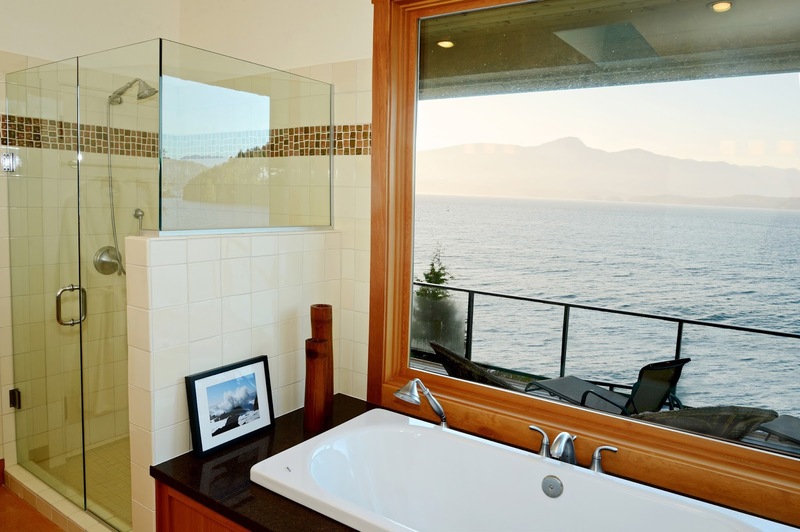 The bathtub in the master bathroom is made for looking out to a cold sea from a warm bubble bath. Shift from the infrared sauna to the king bed in the evening, and wake up well-rested to a view of the water. With a few books on the bedside table and coffee brewing in the kitchen, achieving peace and rest is easy here. 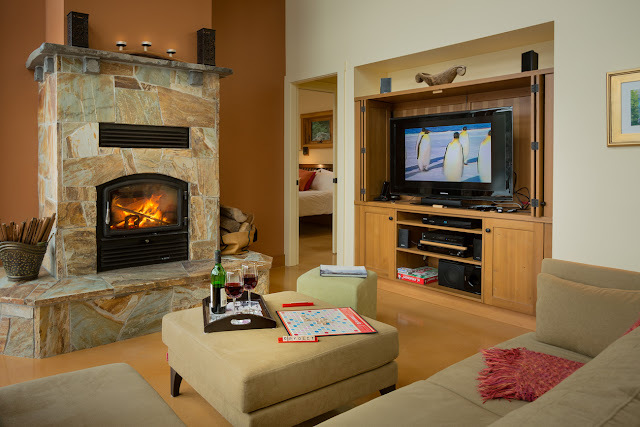 The energy-efficient fireplace puts out a beckoning glow, with logs we provide for your stay. The facing sectional couch and ottoman encourage you to put up your feet and cuddle under a blanket. With the flatscreen TV sitting adjacent, you don't have to move an inch to switch from real fireplace to fireplace channel (if that's your thing), or movies and cable. 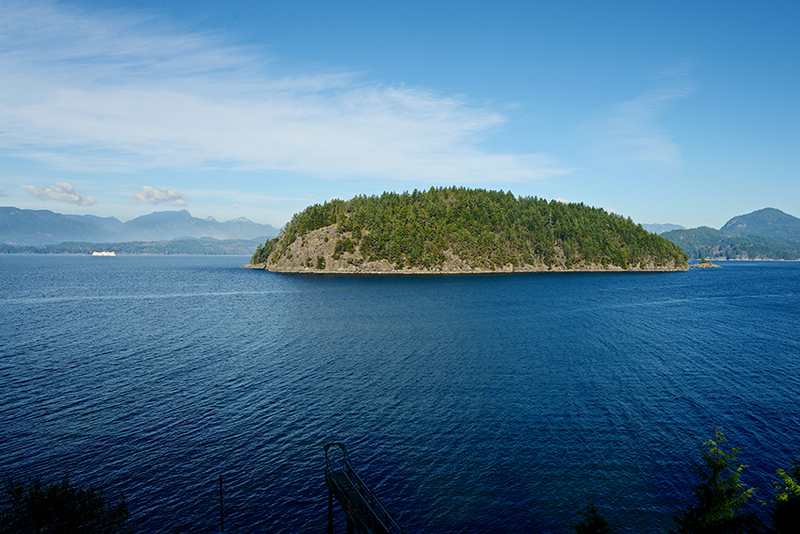 Turn your head, and another view awaits—Howe Sound, featuring all of its inhabitants. 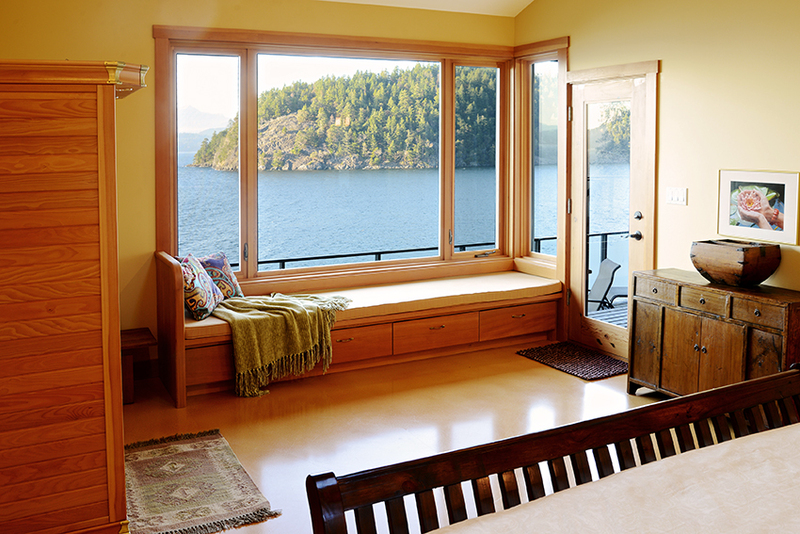 All rooms in this seaside house face Howe Sound and the forested and serene Hutt Island. 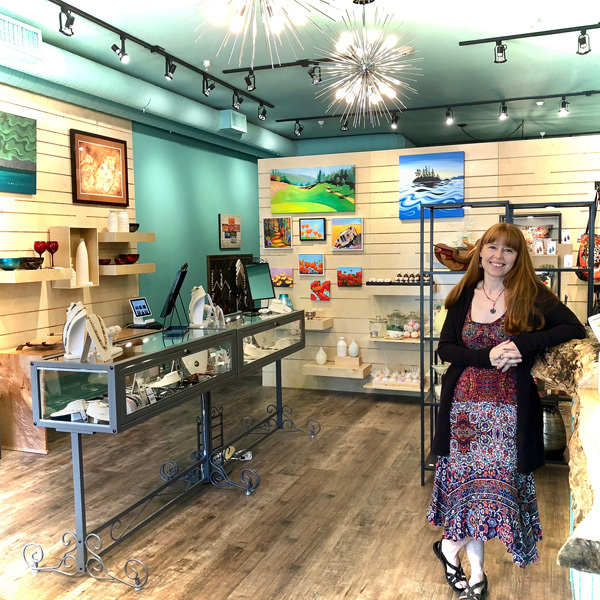 Without the busy boating activity that summer brings, you are likely to see sea lions, seals, otters, waterfowl, diving birds, and eagles, and if you're lucky, whales, which have been returning to the now de-industrialized Howe Sound in search of schooling fish. The Retreat is a wildlife-watchers' dream, and you don't have to brave winter weather to reap the rewards of being close to nature. The fall, winter, and spring are great times for family gatherings on Bowen Island, and especially so at the Eastman Retreat. If the weather is grey one day, then cozy up by the fire and read to each other, or watch movies from the large couch. With three bedrooms and extensive floor space, your family or group of friends can spread out, with no one getting in each others' way. Yet there are plenty of design features that will bring you together, such as the living room sectional sofa, the large dining room table, the breakfast nook, and the barstools around the kitchen island. And since our mild fall, winter, and spring coastal weather is variable, it's likely you will get days bright and warm enough to enjoy our propane BBQ and patio dining furniture on the sweeping deck. 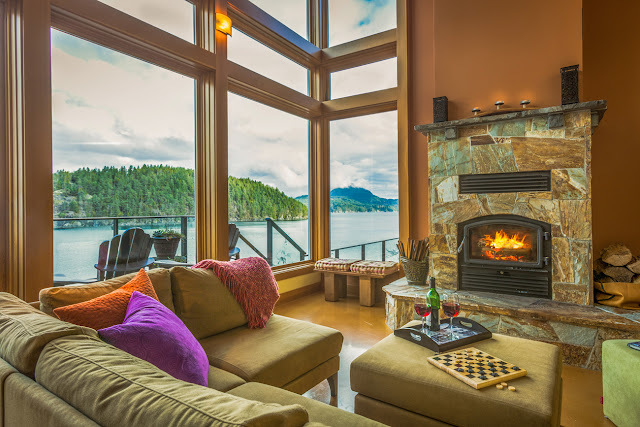 Even if you're on your own or a couple in search of a small BC cabin for rent in the woods, the Eastman Retreat has what you'd intended to find—peace and tranquility, away from it all. Use the downstairs for your living space, cook a romantic meal in the well-equipped kitchen, cuddle by the fire, and then mosey into the bedroom for a nap, all without climbing a stair. Then again, there is the lounging loft upstairs for quiet afternoon reading or sketching sessions. The expansive design of high ceilings, floor-to-ceiling windows, and far-reaching vistas expands the mind, perfect for a creative solo retreat. 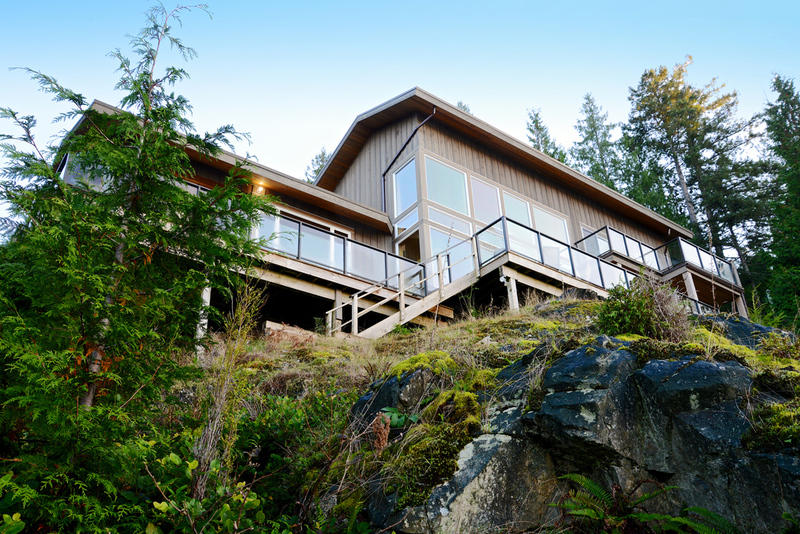 While all of our Bowen Island Accommodations properties are situated in peaceful settings, the Retreat is perhaps the most secluded, almost at the end of its road, on the quiet northwest side of Bowen Island. While traffic noise is virtually zero out here, any sound from boats or the occasional chainsaw in the distance occur mainly when weather is nice, in the summer. So fall, winter, and spring here bring an extra layer of quietude. If you're looking to get away for a special kind of vacation, one that focuses on wellness, rest, wildlife, and peace, the Eastman Waterfront Retreat meets and exceeds all expectations on all fronts. Book for the restfulness of the off-season, and reap the rewards of our discounted shoulder-season rates. Discover the features of this magical part of the island in this gorgeous house for yourself. You'll want to keep it a secret too.